The Posts tab provides a history of all of your published posts. Looking at your posts individually allows you to draw comparisons and see patterns around which posting times might be working best for you, and what type of content your audience might be most engaged with. Start by selecting the social network you'd like to analyze on the left hand side of your dashboard, and then selecting the Posts tab. If you have multiple social accounts of one network (e.g. multiple Twitter accounts), you can change the account at the top, as well as the date range you'd like to analyze. All data can be exported as both CSV and image files using the Export button. 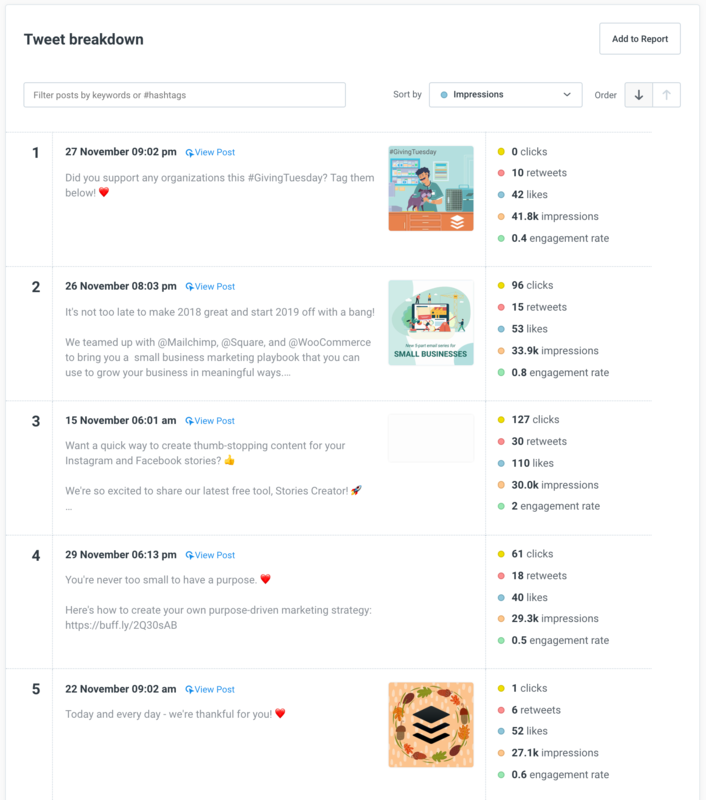 The summary table shows aggregate metrics for all posts sent during the selected date range. The hashtag performance table provides insight into how your hashtags could be affecting your reach and engagement rates. You can use this information to inform your posting strategy by looking at posts with hashtags that are associated with the highest reach and engagement rates. The posts breakdown table shows you all of your your published posts, sorted by Impressions in descending order by default. You can filter posts by keywords and hashtags, as well as sort them either by date or another metric. All metrics are pulled from Facebook's Graph API. The table below provides an overview of which metrics are available in each table and chart. You can find a detailed description of each metric here. All metrics are pulled from Instagram's Graph API. All metrics are pulled from Gnip, which is Twitter’s enterprise data service.